In this lesson we are going to learn how to make a major 9 chord. Major 9 chords are used a lot in jazz, swing, and blues music. They are nice sounding chords that can give your playing some more variety and texture. If you have not gone through the lessons on Major Guitar Chords and Major 7th Guitar Chords, I suggest that you watch them and make sure that you understand these lessons before continuing. This lesson will be in the key of C major and we have provided you with the chord diagram for the major 9 chord shape that we will be learning. As a quick review for you, the C major scale is spelled C, D, E, F, G, A, and B. If you have gone through the lessons mentioned above, you might already know that a C major 7th chord is spelled C, E, G, B. Think about this as just stacking a major third, C to E, a minor third, E to G, and another major third, G to B. In order to make a major 9 chord just stack another minor third on top of the B, or 7th, of the chord. A minor third away from B is D. D would be the major 9th of C. Just tag that note on to the C major 7th chord to get your C major 9 chord. The formula for a major 9 chord is root, 3, 5, 7, 9 and a C major 9 chord is spelled C, E, G, B, D. You can also think of it as stacking a major third, a minor third, another major third, and one more minor third. You can also look at make a major 9 chord as just adding a note to a major 7th chord that is a 9th away from the root of the chord. Fore example we are in the key of C and we are building a C major 9. Start counting up the C major scale, with C being one, all the way up to the ninth note. That would look like this: 1C, 2D, 3E, 4F, 5G, 6A, 7B, 8C, 9D. Notice that when you get to C again you just count it as eight and then count the D as nine. 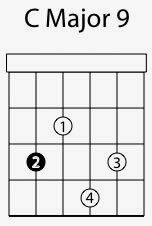 D is the 9th of C so just add a D note to the C major 7th chord. Try this voicing for a C major 9 chord. Place your 2nd finger on the 3rd fret of the 5th string. This is a C, your root note. Your 1st finger should go on the 2nd fret of the 4th string. This note is an E, the 3rd of the chord. Grab the 4th fret of the 3rd string with your 4th finger. This is a B, the 7th of the chord. Play the last note in this chord shape with your 3rd finger on the 3rd fret of the 2nd string. This last note is a D, the 9th of the chord. You might notice that we left out the 5th of the chord, the G note. There is a good reason for this. Often in jazz, or other kinds of music where there are a lot of things going on harmonically, you can leave out the 5th or root of a chord and it will sound just as good or better than it did if you included it. Thick chords like this can easily get muddy, especially if you have a keyboard player and a bass player that are already playing the 5th or root of the chord. This shape is movable so play it up and down the fretboard until you are comfortable with it. Come up with your own major 9 chord voicings and start using them in your playing. Try substituting some major 9 chords for some major 7 chords is music that you are already playing.